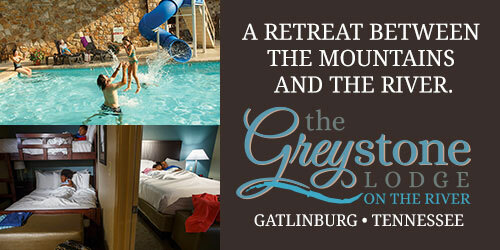 Turn your Great Smoky Mountain vacation into a restful retreat by checking in at the Greystone Lodge at the Aquarium. Located on the banks of the Little Pigeon River in the heart of Gatlinburg, Tennessee, the Greystone Lodge offers top-notch accommodations within walking distance of some of the area’s top attractions. Experience casual opulence in executive rooms and upgraded suites thanks to this Smoky Mountains hotel’s recent $5 million renovation, or opt for budget-conscious lodging in the family-friendly standard rooms. Make the most of your time in the mountains at this charming lodge.